Chris Archer visits NW !!! Updated Thursday October 5, 2017 by Donnie Snyder. Northwest Youth Baseball and Softball would like to thank Good Sports and the Rays for their generous donation of equipment which included helmets, bases, gloves, tees, catcher's gear, and much more! Aaron and Kayley from Good Sports flew all the way from Massachusetts to present our league with this equipment. 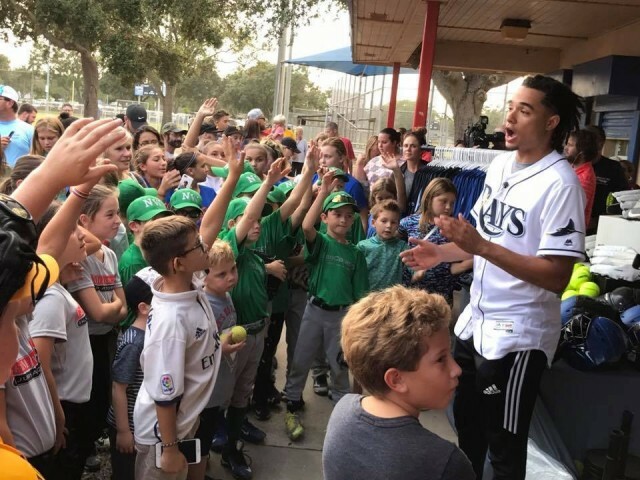 They were joined by Chris Archer from the Tampa Bay Rays who took the time to talk to the players, coaches, and parents as well as answer questions. To top it off, he then stayed at the park to watch our 12U softball game! Northwest is extremely appreciative to Good Sports and the Tampa Bay Rays!